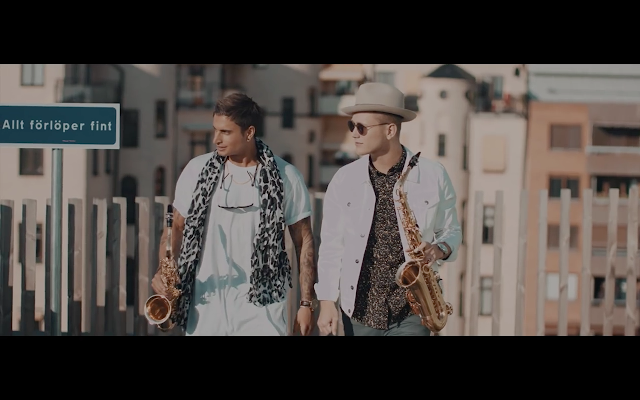 When last we wrote about Samir & Viktor, the duo had just released their current single, "Saxofuckingfon," but had yet to release the music video. Now that the peak of summer has been reached, the two have finally filmed and posted the visual narrative to one of the absolute catchiest summer bops. Enter our heroes at a gathering of pretentious Östermalm-looking types. Just look at this group's hideously country-club-looking outfits and bougie champagne glasses and you know that trouble's brewing. They don't want Samir & Viktor to join in on their party. So how do S&V respond to this sort of exclusionary disrespect? Invite a bunch of crashers, gather up a few saxofuckingfons, and get the real party started! Though some folks have been dismissive of Samir & Viktor and their ridiculously catchy singles, there is in fact plenty to like about this video. The platform on which S&V have built their success is a genuine love for having fun and bringing joy to the folks who will pay them any sort of attention (they also used their performance during this year's Melodifestivalen finals to speak out against cyberbullying) and this video is entirely befitting of this thesis. Sure, the video is utterly ridiculous with the terrible choreography and the ghastly outfits to be seen that are worn without an ounce of irony. But in the video's turning point and its ending we see a message of positivity that promotes unity amongst all people who are simply looking to have a good time. It's not about poking fun at those who dare to be different, or getting revenge against those petty Östermalmers who wouldn't let you into their party. Whether you're the type to wear too much hair product, or lip-synch along to the auto-tuned hook of your song, in S&V's world you'll always be welcome to let it rip and get down to the Saxofuckingfon!